RIT professor Zoran Ninkov, right, and Dmitry Vorobiev â€™17 (astrophysical sciences and technology), a postdoctoral researcher in RITâ€™s Chester F. Carlson Center for Imaging Science, work on a new astronomical imaging system using technology found in Texas Instrumentsâ€™ digital cinema projectors. Rochester Institute of Technology researchers are developing and testing an astronomical imager inspired by an Oscar-award winning cinema projection system. RIT scientist Zoran Ninkov modified Texas Instruments’ Digital Micromirror Device—the micro-electro-mechanical systems, or MEMS, device found in Digital Light Processing projectors—to simultaneously capture light signatures from multiple objects in the same area of sky. The RIT astronomical imaging system is competing with other technologies for deployment on future NASA space missions for surveying star and galaxy clusters. 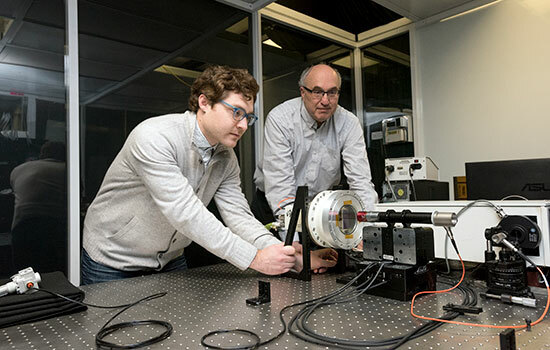 NASA is supporting Ninkov’s ongoing research on the RIT multi-object spectrometer with a $550,000 grant to recoat the Digital Micromirror Device with aluminum to increase its reflectivity and performance at ultraviolet wavelengths. The Texas Instruments device consists of 2048-by-1080 individual mirrors that can switch between two positions at thousands of times per second. Ninkov recognized the programmable mirrors had applications in astronomical imaging and remote sensing. During the last decade, Ninkov’s team turned the commercial product into a scientific instrument to detect and capture astronomical data. The new technology selects targets from a two-dimensional sky field and deflects light down two distinct pathways—either to an imaging spectrometer or to an imaging array detector. The spectrometer records light at many contiguous spectral wavelengths and compresses information in the field of view into a data cube. The imaging detector array captures light signals from the objects with a charge-coupled device similar to technology found in digital cameras. Ninkov’s team includes Dmitry Vorobiev, a postdoctoral researcher at RIT; graduate students; and collaborators at NASA Goddard Flight Center. Ninkov leads the Laboratory for Advanced Instrumentation Research in RIT’s Center for Imaging Science. He is also a member of RIT’s Center for Detectors and the Future Photon Initiative.